Armed with an M.Text and a Post Graduate Diploma in Marketing Management, Mr GV Aras began his career at Textile Engineering Group - A.T.E. as Sales Engineer in 1981, in which, he has now risen to the current position of Director. A.T.E. Group today is the biggest textile machinery supplier across the textile value chain in India with sales turnover of around Rs. 10 billion and represents world leaders in textile machinery most of them European like, Truetzschler, Oerlikon, Karl Mayer, Monforts, Fongs Group, Osthoff and Zimmer. Mr Aras has traveled widely across the world and worked towards bringing in joint ventures with many of these leading European machinery manufacturers. He has also presented many technical papers at international forums. 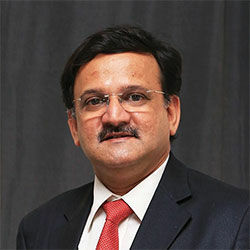 He is a member of Institution of Engineers, member of the V.J.T.I Senate and technical advisory group, committee member of "Bureau of Standards" for textile machinery & accessories, committee member of "Indo-Vietnamese" Chamber of Commerce, and was managing committee member of the Textile Machinery Manufacturers Association (TMMA) for 3 years in the past. TT: What is the current market scenario of nonwovens machinery in India? Most of the existing players in the nonwovens industry have been using second hand or Chinese plants. These technologies are somewhat older or inferior but still useful as most of the products manufactured are in the lower end of the value chain like spun bond products. The equipment from Europe has found way in some projects where the market focus was mainly on Europe and USA for the end products. TT: How would you rate the Indian nonwovens industry vis-à-vis those in China and Taiwan in terms of investment, number of companies, products produced, etc? The Indian nonwovens industry is much smaller in size compared to China and Taiwan. Perhaps we are at a stage where China was 10 years back. There are very few companies in India in this field who have a significant production volume, while there are many companies in the lower product range with smaller volume. In China, almost all the technologies in nonwovens are covered in production and covering domestic as well as export market. Within China even per capita nonwovens consumption is much higher than in India. In India Needle punched and spun laid products are mainly produced while spun lace production is surely growing after 3 new projects come up in India in the last 5 years.